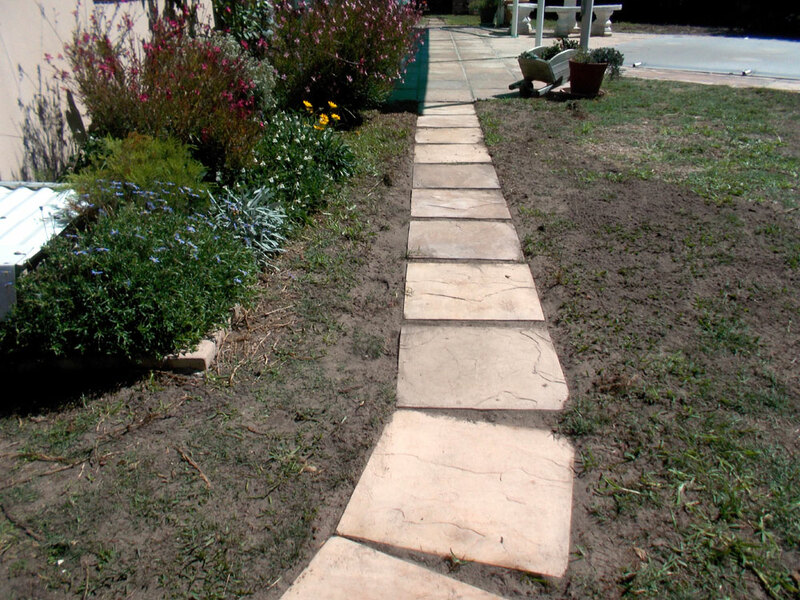 Paving slabs are available in a range of shapes, sizes and designs. In this case we used 440x440x40*mm slabs in a sand colour and spaced 50mm apart. 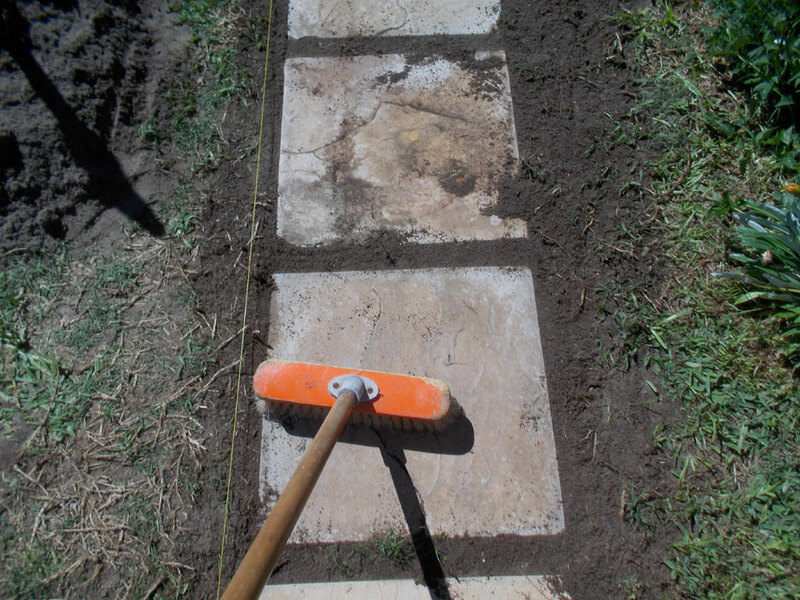 Laying a straight path using slabs is relatively easy – all you do is measure the total length to be covered (and total width if you are going to lay a single row or double up), add the spacing between each slab, and calculate the number of slabs you will need. If, however, you wish to build a curve into the path then it becomes a little more complicated – but not overly so. This is how you calculate the number of slabs requires, let’s say, for a 90° curve. 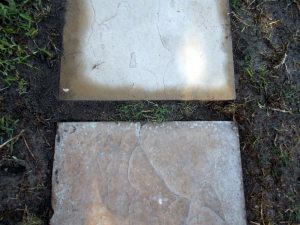 Let’s say each slab is 440mm along each edge and you wish to have their inner corners touching. You want a reasonably wide curve with a radius of, say 3m. The circumference of a circle is 2πr (or πd) where π is pi – 3.142, ‘r’ is the radius. You can also calculate the circumference by multiplying the diameter by pi – hence πd, where ‘d’ is the diameter – they both amount to exactly the same. So, the circumference of a circle with a radius of 3m is 2x3x3.142 = 18.852m. 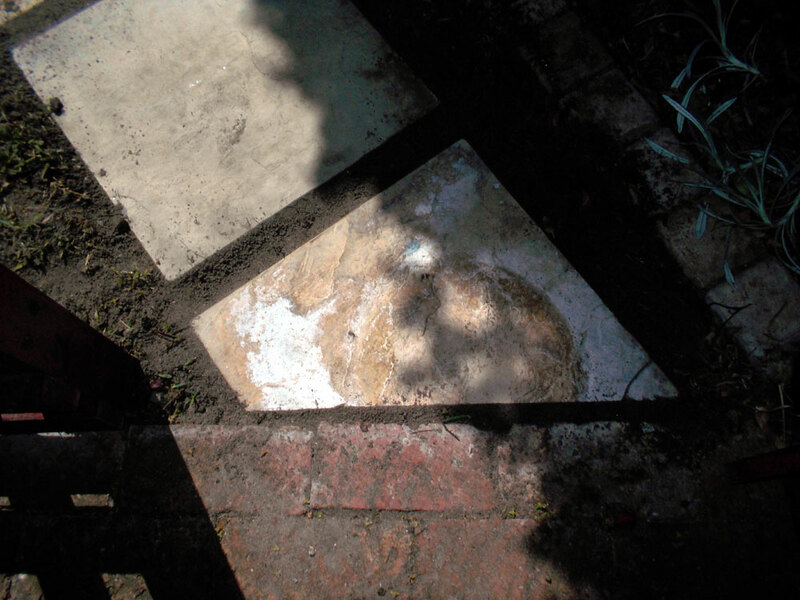 Round that off to 18.85m, and then divide by 4 – because you want only ¼ of the circle. That comes to 4.713m, or 4713mm. 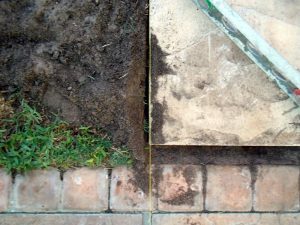 divide that by 440 = 10.7 slabs. 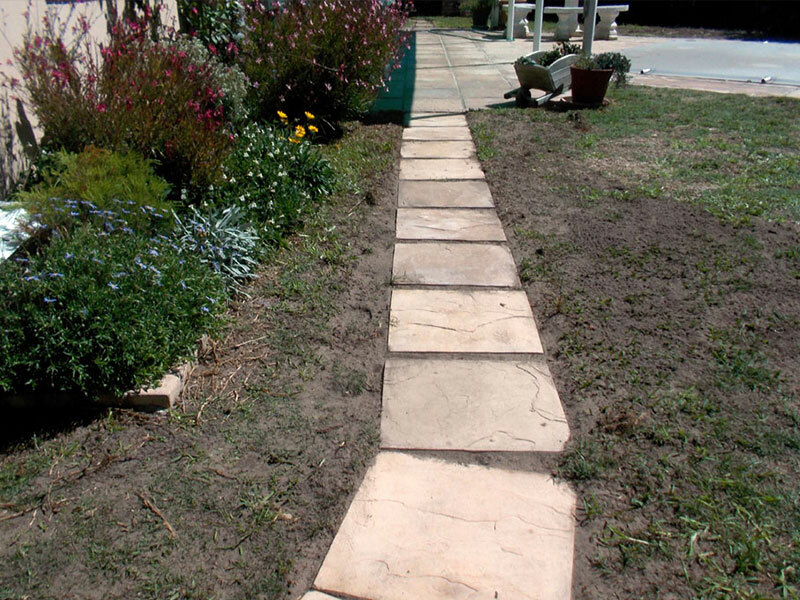 What you want then, is to use 10 slabs, for a total length of the ¼ circle being 4400mm, or 4.4m. Now work it backwards… 4.4×4=17.6m. 17.6÷2÷3.142=2.8 – hence your required radius must now be 2.8m. And that’s all it is – simple substitution. We wanted the path to line up with the existing paved patio, so we used a builder’s line, tightly stretched along the junction between the slabs, to align the path. When laying the first slab, make sure that its surface is exactly level with the paving it joins – any difference in levels could cause someone to trip. 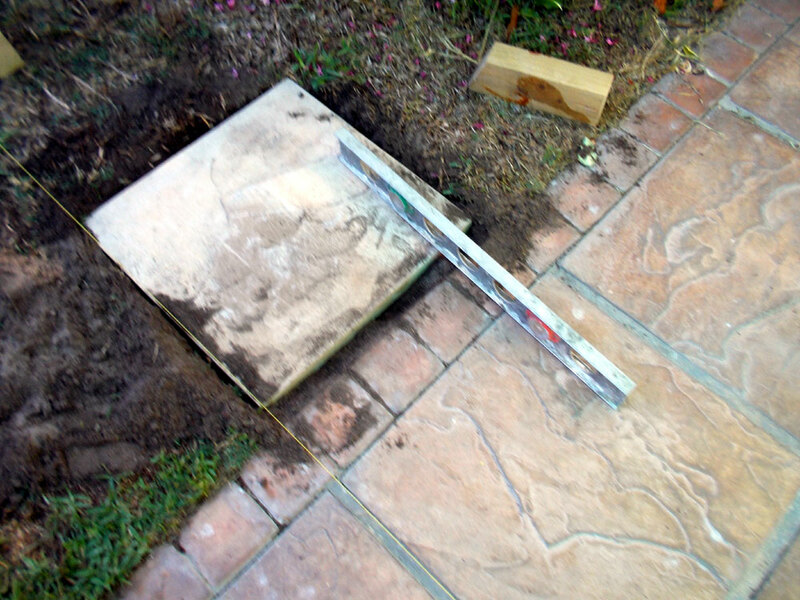 Add and remove soil from under the slab and constantly check the slab is level on all axes. 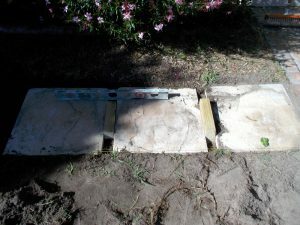 Ensure that one you have it level, you lift it carefully and add soil to any areas where it seems the underside of the slab might be ‘hanging in midair (it is important that the base of each slab is fully supported to avoid any cracking when a person steps on it. 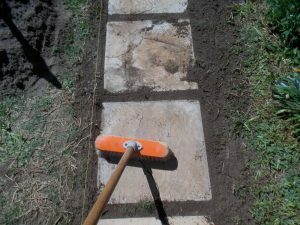 This is how the slab is aligned with the line – note that it does not touch the line (if it does the line will be pushed to one side and your path with be crooked). The first three slabs laid… note the use of 50mm timber offcuts as spacers. When removing soil, remove as little as possible; digging too deep means that the soil used to refill the space is uncompacted and will subside in time – as will the slab on it. Getting the radius correct. 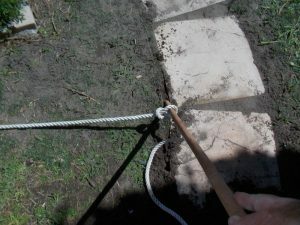 Here we used stout rope with very limited stretchability, but if you do not have any handy then use a length of chain. 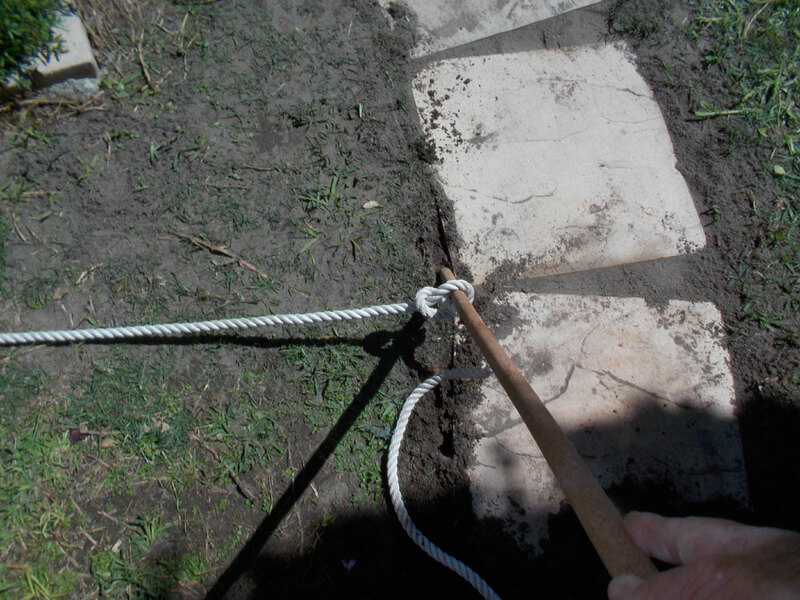 Avoid using string… in pulling it taut you can stretch it and your perfect curve will end up ovoid – something to avoid, pardon the pun. 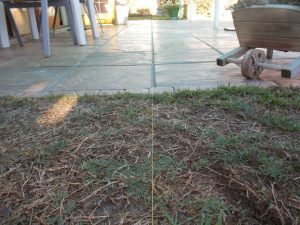 The way to get the curve is to push your pointer into the soil at the last corner of the straight section, and walk back, as close as you at 90° to the straight section, and push your pivot into the soil. 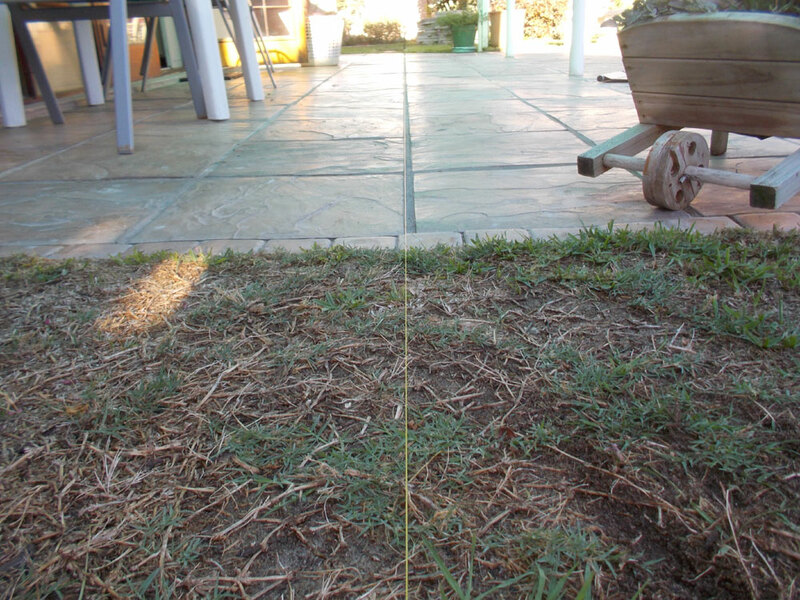 Now go back to your pointer, move while using the point to make a line in the soil to where you want the curve to end. You should now have a perfect curve. 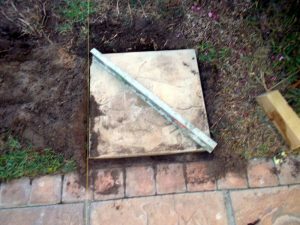 Lay your slabs out along the curved line you have just scored. When satisfied, dig out their respective positions and place them in their final positions – taking care to do all the levelling and filling and backfilling detailed above. 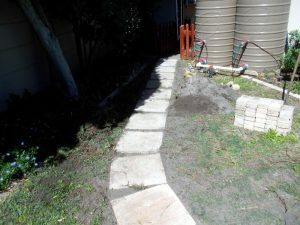 The completed first part of the path and curve in the background. 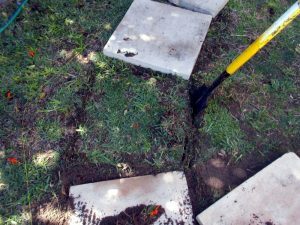 …Taking the time to also take some of the lawn-grass runners you dug out to give the gaps an early start to filling with grass. 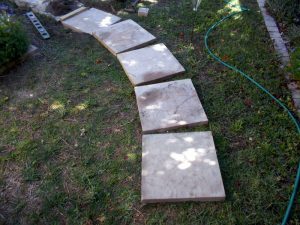 After the curve, this path straightened out again. It met the existing brick paving on the other side at an angle of about 60°. 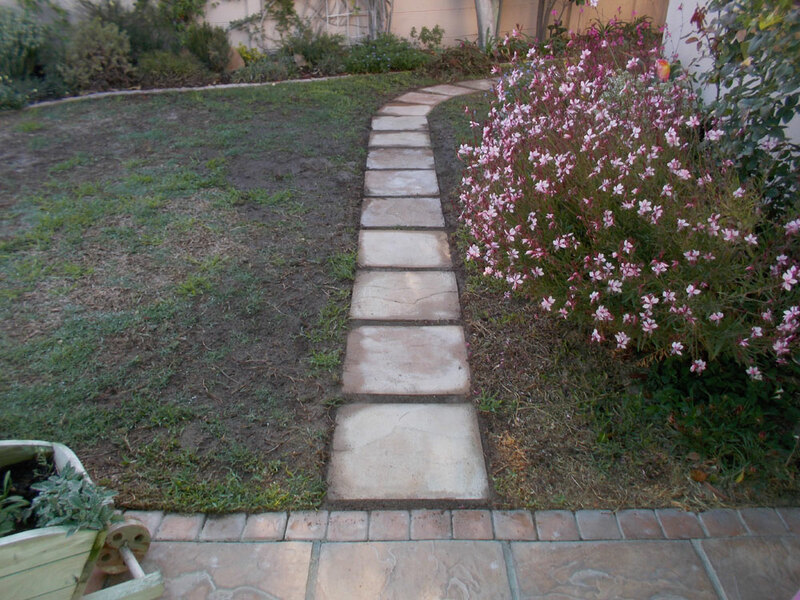 Just step this way… a view back to the patio area. Note that the soil excavated from the project has been used as topsoil for the surrounding lawn. Estimated time: Depends on the size of the project… length of path, number of slabs to be laid etc. These materials are available at Selected Mica Stores. To find out which is your closest Mica and whether or not they stock the items required, please go to our store locator HERE, find your store and call them. If your local Mica does not stock exactly what you need they will be able to order it for you or suggest an alternative product or a reputable source.